• Give your room a fresh coat of paint – just make sure you run the paint colour by your property management staff so they can approve of the shade beforehand. • Create your own artwork! Check out local workshops (https://www.tettcentre.org/events for example) and create a masterpiece for that vacant living room wall. • Restore your old furniture. With some elbow grease, sandpaper, and chalk paint, a little work can create a beautiful rustic aesthetic. • Get inspired by interesting storage ideas. 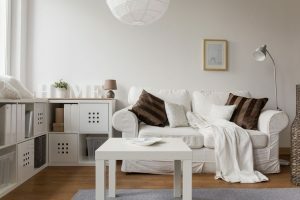 Check out Ikea catalogues, Pinterest and Etsy to find creative ways of storing items while simultaneously decluttering! • If all else fails, add some plants to bring in some colour and life to your space. A little work goes a long way to bring colour and comfort into your unit. If you’re in the market looking for a space to call your home, follow us on Facebook, as well as our website (www.panadew.ca/available-rentals) to find out about available units as soon as they’re available!